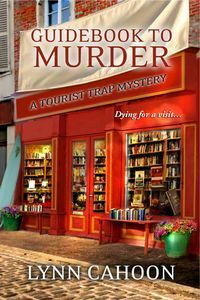 Guidebook to Murder by Lynn Cahoon: Synopsis and Online Purchase Options. Synopsis (from the publisher): In the gentle coastal town of South Cove, California, all Jill Gardner wants is to keep her store — Coffee, Books, and More — open and running. So why is she caught up in the business of murder? When Jill's elderly friend, Miss Emily, calls in a fit of pique, she already knows the city council is trying to force Emily to sell her dilapidated old house. But Emily's gumption goes for naught when she dies unexpectedly and leaves the house to Jill — along with all of her problems … and her enemies. Convinced her friend was murdered, Jill is finding the list of suspects longer than the list of repairs needed on the house. But Jill is determined to uncover the culprit — especially if it gets her closer to South Cove's finest, Detective Greg King. Problem is, the killer knows she's on the case — and is determined to close the book on Jill permanently.